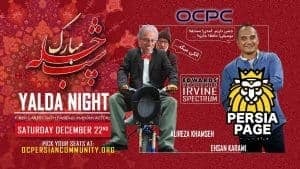 Saturday, December 22, 2018 Special Performance by Alireza Khamseh & Ehsan Karami. 500 Spectrum Center Dr., Irvine, California 92618. Shab-e Yalda (“Yalda night” Persian: شب یلدا‎) or Shab-e Chelleh (“night of forty”, Persian: شب چله‎) is an Iranian festival celebrated on the “longest and darkest night of the year,” Yalda is a winter solstice celebration,[rs 1] that is, in the night of the Northern Hemisphere’s winter solstice. Calendrically, this corresponds to the night of December 20/21 (±1) in the Gregorian calendar, and to the night between the last day of the ninth month (Azar) and the first day of the tenth month (Dey)[rs 2] of the Iranian civil calendar. [rs 2] The longest and darkest night of the year is a time when friends and family gather together to eat, drink and read poetry (especially Hafez) until well after midnight. Fruits and nuts are eaten and pomegranates and watermelons are particularly significant. The red color in these fruits symbolizes the crimson hues of dawn and glow of life. The poems of Divan-e Hafez, which can be found in the bookcases of most Iranian families, are read or recited on various occasions such as this festival and Nowruz. Shab-e Yalda was officially added to Iran’s List of National Treasures in a special ceremony in 2008. The longest and darkest night of the year marks “the night opening the initial forty-day period of the three-month winter”,[rs 1] from which the name Chelleh, “fortieth”, derives. [rs 2] There are altogether three 40-day periods, one in summer, and two in winter. The two winter periods are known as the “great Chelleh” period (1 Day to 11 Bahman,[rs 2] 40 full days), followed/overlapped by the “small Chelleh” period (10 Bahman to 30 Bahman,[rs 2] 20 days + 20 nights = 40 nights and days). Shab-e Chelleh is the night opening the “big Chelleh” period, that is the night between the last day of autumn and the first day of winter. The other name of the festival, ‘Yaldā’, is ultimately a borrowing from Syriac-speaking Christians. [rs 1][rs 3][rs 4][rs 5] In the 1st–3rd centuries, significant numbers of Eastern Christians settled in Arsacid and Sassanid territories, where they had received protection from religious persecution. Through them, Western Iranians (i.e. 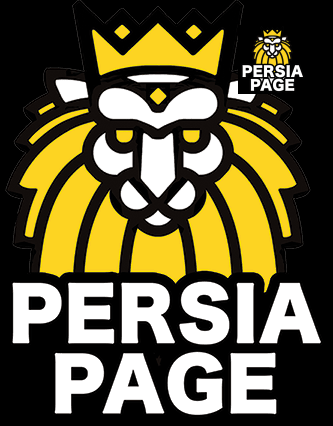 Parthians, Persians etc.) came in contact with Christian religious observances, including, it seems, Nestorian Christian Yalda, which in Syriac (a Middle Aramaic dialect) literally means “birth” but in a religious context was also the Syriac Christian proper name for Christmas,[rs 6][rs 4][rs 1][rs 3] and which—because it fell nine months after Annunciation—was celebrated on eve of the winter solstice. The Christian festival’s name passed to the non-Christian neighbors[rs 4][rs 1][rs 3][rs 5] and although it is not clear when and where the Syriac term was borrowed into Persian, gradually ‘Shab-e Yalda’ and ‘Shab-e Chelleh’ became synonymous and the two are used interchangeably. The word yalda, cognate with the Arabic Yelda meaning ‘dark night’ might be related to the Old Norse ‘jól’/Old English ‘geōl’ (yole – yule). music, dancing and interactive exhibits. This one of a kind exhibition features some of our world famous poetry, literature, and traditions, along with a display of “Korsi”. We invite you to come and celebrate this event with your entire family. Tickets are $5.00 each. Food and beverages are available for purchase.